Metastases can occur as part of the natural progression of a variety of malignancies and their mode of spread, manner of presentation, and prognosis are as variable as their primary sources. The ultimate goal of musculoskeletal treatment of skeletal metastases is to get the patient in question back to his or her previous level of function as soon as possible. Skeletal metastases are seldom life threatening and their treatment will rarely render someone cured of their primary disease. Nevertheless, involvement of a musculoskeletal specialist as a part of the multidisciplinary approach can and very often does provide significant improvement in patients’ qualities of life. 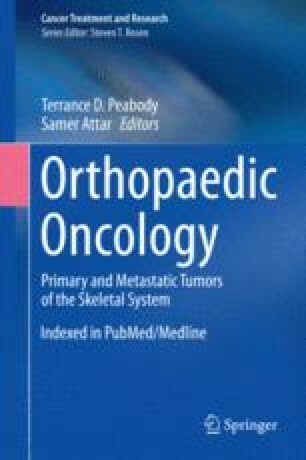 The purpose of this chapter is to discuss the evaluation of a patient with suspected metastatic disease involving the musculoskeletal system and their pre-, intra-, and post surgical management as part of a multidisciplinary team.